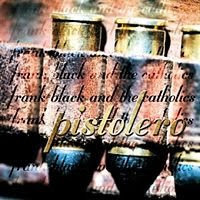 I was down on Pistolero for a while, and now I don't remember why. Listening to it tonight, I'm only remembering all the things I liked about it when it first came out. Apparently it's aged well. Or, I've been listening to a lot of Frank Black recently, and it's all sounding pretty good. Probably a bit of both. This record is basically the self-titled debut: part two, except Lyle Workman has been replaced by Rich Gilbert on lead guitar, and FB seems considerably more agitated. And that's a good thing. The songs are a little more lyrically ambitious, and the straight-ahead approach that bogged down some of the middle of the previous record is all but gone. A song like "Billy Radcliffe" is a steady jam, but the jaunting melody and the slightly bizarre narrative that comprises the lyrics keeps it interesting. I hated "I Love Your Brain" the first time I heard it, but I learned to really like it. I was quick to dismiss it as obvious pandering, but I think it goes a bit deeper than that (though not much), and underneath the lyrics, which I may have been paying too much attention to, lies a catchy song that isn't trying to be what I has hoping to make it into in the first place. If that makes sense. There's some other winners on here, too: "I Switched You," while possibly being a minute too long, is effectively choppy and hard-hitting where it should be. "Tiny Heart" is saved from being a standard FB one-off by its slow pre-chorus that make the entire song. It's followed by "You're Such A Wire," a western-ish number that is a little timid, but short enough to work. And that's a great song title. Things get a little muddled towards the end, with songs like "I Want Rock & Roll" seeming oddly misplaced and forced. But what the hey, it's loud and chaotic, and that's not a bad thing, especially after following the supremely decent "I Think I'm Starting To Lose It." The album ends fairly strong, with "Skeleton Man," a song I always liked, and "So. Bay," a track that starts off with a distinctively Pixies-ish bass line which quickly gets drowned out by a mess of guitar. Another one that maybe goes on a bit too long, but I always thought the lyrics were pretty sharp. I know some will disagree with me, but I think I have perhaps judged this record a bit too harshly in the past. Like I said, there's some speed bumps, and it might not be his strongest effort, but I forgot how much I like some of these tracks. Worst album cover ever. It looks like I made that on photoshop. In a rush. And I have never used photoshop.